And the winners of the Battle of the Ardennes are Jean-Karl Vernay and Julien Briché ! The spectators attending this weekend’s races in Spa-francorchamps were right to make the trip. Has it was already the case on Zandvoort, the TCR Benelux brought two thrilling races with very good winners. With good weather conditions from the beginning to the end of the meeting, and a great deal of conviviality inside the paddock between the different competitors, this second round of the 2018 season was a real success among teams and the pilots. It quickly became clear that Jean-Karl Vernay was the man to beat this weekend when he signed the best absolute time during the two free tryout sessions and got the pole position in the Europe and Benelux ranking for Race 1. But the Leopard Lukoil Team Audi RS3 LMS driver had to keep an eye on his two direct pursuers, Maxime Potty who was in very good shape running at home with his Volkswagen Golf GTI TCR from Comtoyou Racing and Julien Briché whose Peugeot 308 TCR from JSB Compétition would confirm the potential we had the chance to glimpse in Zandvoort. Thanks to his 8th absolute best time, Stefano Comini (Honda Civic Type-R #42 Autodis Racing by THX) was the best qualified competitor from TCR Benelux for Race 2. Held this Saturday evening, Race 1 would again be largely dominated by Jean-Karl Vernay. The French dominated this first standoff which lasted 23 minutes + 1 lap from the beginning to the end but with Maxime Potty never far behind him. The last TCR International Series champion crossed the finish line leading his young opponent with 0.7. In addition, the two men monopolized the two first places of the TCR Europe. Stefano Comini was well on his way to complete the podium of the TCR Benelux for his first appearance of the championship’s season. He had to drop out after touching another contestant on the sixth lap. To the benefit of Julien Briché who offered a first 2018 podium to Peugeot. After that came Danny Kroes (Cupra Léon TCR #38 PCR Sport), Cedric Piro (Honda Civic Type-R #13 Autodis Racong by Piro-Sports), Loris Cencetti (Hyundai i30 TCR #14 Autodis racing by Piro-Sports) and Marie Baus-Coppens (Cupra Léon TCR #21 JSB Compétition). The second stand-off took place on Sunday at 11h20 and was to be the scene of an amazing duel between Maxime Potty, Julien Briché and Jean-Karl Vernay. Fastest off the blocks, Maxime Potty resisted to the assaults of the two Frenchmen for several laps before being definitly overwhelmed while braking in the Combes at mid-race. Briché then had to keep an eye on a very determinated Vernay until the Audi pilot rammed his compatriot on the antepenultimate braking action at the Bus Stop. The RS3 LMS #69 had to stop on the side of the runway with a broken suspension. 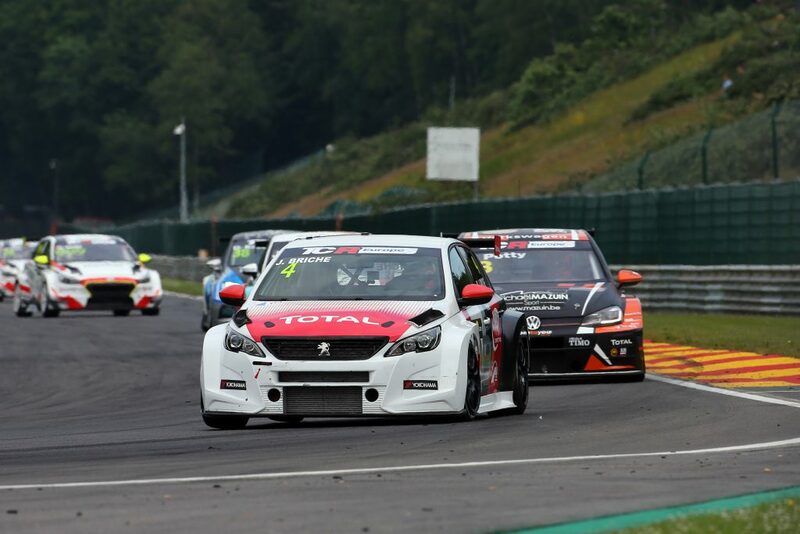 Julien Briché kept on going and finally took his first victory in TCR Benelux, one week after his victory in the Peugeot 308 Racing Cup on this exact same Circuit of spa-Francorchamps. A final decision, taken after the race, will also allow him to take over the TCR Europe. Very efficient on a race track that he had just discovered, Danny Kroes took precious points in the championship with a nice third place. Cedric Piro and Marie Baus-Coppens completed the first five winning podium of the TCR Benelux. On the other side, Stefano Comini lost all chance to be in good position due to engine problems and Loris Cencetti was forced to stop near the finish line after colliding with another TCR Benelux contestant. 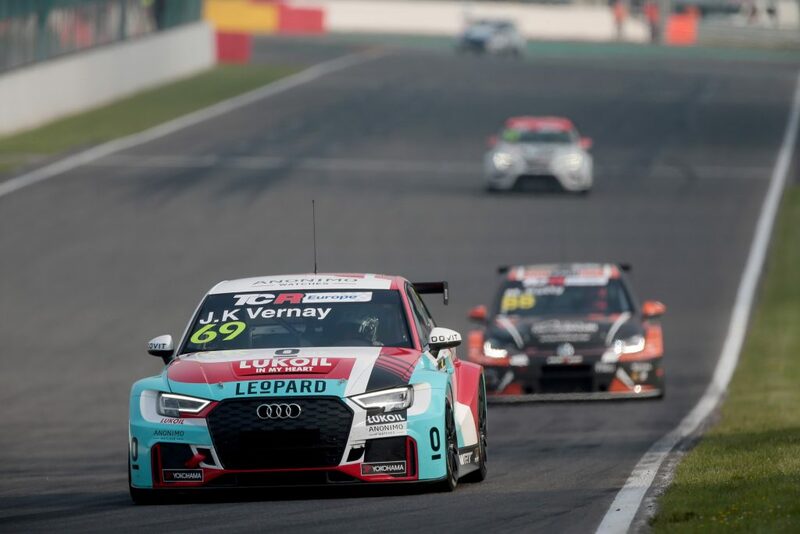 The next 7th and 8th of July, the competitors from TCR Benelux will set their courses to the East to compete in two races on the Hungaroring for the International GT Open.